You’ve done the hard part: spent a lifetime getting out of bed and going to work, taken care of your family, and saved up for a nice, long retirement. But what exactly do you do to fill all your hard earned free time? Boredom and depression are some common reactions people have to retirement, where there seems to be so much time and so little to do. Fight off restlessness by focusing on recreational activities or volunteer work to keep busy. Write your memoirs. This could be in the form of letters to your living relatives, or journal entries every day. Recording your past experiences and adventures will allow you to share these moments with loved ones and relay life lessons to others. Start by recording your memories in a journal or writing letters to a specific family member, such as your children or grandchildren. Try to write a little every day to get into the habit of writing down your thoughts and memories. You could also take a memoir writing class at your local college or university. Many university level classes are free or discounted for seniors. 2)Read your way through a book list. Maybe you have an ongoing list of books you’ve been keeping all these years for when you have the time to delve into them. Head to your local library and work your way through a book list, whether it’s a personal one you have been keeping, or a comprehensive book list of Western classics, the top thrillers and mysteries, non-fiction must reads, or great sci-fi books. You can also choose a specific genre or topic that you are interested in and focus on reading as much about a topic as possible. For example, World War II historical fiction, or wood working. Ordering books online is easier than ever now through Amazon or Indigo. Simply googling the title or author of the book, look for it online, and order it for fast and cheap shipping straight to your door. Books on tape, or audio books, are also a good option if you prefer resting your eyes and listening to a good book read by a professional actor or voice artist. Exercising your brain by learning a new language will keep your mental facilities sharp and clear. Try a computer based language program like Rosetta Stone or Duolingo. There are also over 48 languages, from Spanish to French to Chinese, that you can learn online for free through courses you can download and complete at your own pace. If you are looking for a reason to get out of the house, sign up for a language class where you do in person activities and practice sessions to improve your conversation skills. 4) Do a weekly physical activity. Staying active is another important way to stay busy during retirement. A physical activity like tennis, golfing, swimming, or jogging, done once a week, can keep you healthy and grounded. If you’re looking to meet other people or socialize, go for team activities or sports. Look for master classes set up for older or senior participants. Sign up for a senior specific class to allow you to meet other people and socialize. You can also sign up for lessons or classes to improve your serve or your breaststroke. These classes will also help you meet other people who may be interested in the same hobbies or activities as you. Look for clubs that may appeal to your interests or hobbies, such as a bridge club, a senior women’s or men’s recreational club, a golf club, or a church club. Check the club listings online in your area or the postings on the community board in your local coffee shop or grocery store. 6) Take a class and learn a new skill. Focus on a hobby that you would like to improve on, like learning how to crochet more complicated patterns or carve more difficult wood sculptures. Look for classes at your local community center or college. You can also attempt to learn a completely new skill and use your free time to explore a skill you’ve always wanted to try. Many universities and colleges have lifelong learning programs for seniors, where you pay very little or nothing at all to take adult learning classes. You can also make new friends in a learning environment. 7) Cook your way through a cookbook. If you have never been confident in the kitchen or are looking for ways to expand your recipe repertoire, choose a cookbook and work your way through it one recipe at a time. This could be a cookbook that focuses on a certain style of eating, like a vegetarian or gluten free diet, or a region of cooking, like Thai food or Polish food. You could also tackle a food bible, like Julia Child’s Mastering the Art of French Cooking, and learn how to properly braise meat or make a delicious sauce. Once you feel you have mastered a recipe, use your friends or family as guinea pigs and invite them over for a big meal, or have a potluck where everyone cooks something. 8) Construct your family tree. If no one in your family has put together a family tree or a record of your family’s ancestry, use your retirement time to do this. Conduct research and contact immediate and distant family members to put together a comprehensive tree of all of your family’s connections. You can also use online tools like ancestry.com or My Family Tree to help you with your research. When you’re done, make a decorative image of the tree to give to your family members or scrapbook the family tree so it will be preserved and cherished for years to come. 9) Go on a road trip. If you have access to a car or an RV and enjoy a long drive, map out a route around your city or area. Or choose a destination on the map close to your home and look for a scenic route or a route with natural wonders or man made oddities (the world’s largest paper clip?) along the way. Going on a road trip will introduce you to new sights and people, and fill your time with new experiences. Having access to an RV will allow you to take longer trips, to farther destinations, in comfort. 10) Travel overseas or to another country. Maybe you have relative you’ve been meaning to visit across the pond or in another country. Or perhaps you have always wanted to see Michelangelo’s sculptures in Florence, or the pyramids in Egypt. Plan a trip to see the great wonders of the world, solo, or with a friend or family member. There are many flight deals available online, especially if you have the time to travel off season or during a less popular time. Do a web search for package trips, which usually include airfare, accommodations, and guided tours and activities. 11) Spend time with family. One of the best ways to use your free time is to spend quality time with your relatives, from grandchildren to your children to brothers and sisters. If you are close with your family, arrange weekly play dates with your grandchildren to give your week structure. Go to cultural events, like the opera or the ballet, or spend time camping and going on trips with them. Sign up for mentorship opportunities through your local community center, whether it’s working with children as a Big Brother or Big Sister, or tutoring adults in a literacy program. Look for mentorship positions that draw on your individual skills and abilities and allow you to share these abilities with others. 2) Volunteer at a local organization. Focus on local organizations that you would like to assist or be a part of. Contact them by calling or emailing them and tell them what you would like to do to help. Many nonprofit and government organizations are constantly looking for volunteers to donate their time and energy towards a specific cause. 3) Focus on a new career. Though you may not be ready to jump into another career after putting years into your previous one, think about a career or job you have always wanted to pursue. This could be home decorating, starting your own business, or even freelance writing. Focusing on a new, less stressful career will fill up your time and give you a renewed sense of purpose in your retired life. 4) Do part time work. The joy you felt at your retirement party is a fading memory; you’ve begun to feel restless. Or perhaps you could use some extra money for health insurance or a cruise. You’ve got company. Forty percent of boomers plan to work part time after leaving their main jobs, according to a recent survey by the Transamerica Center for Retirement Studies. Many will use the skills of their former work lives. Others will find an entirely new field. Do you speak Spanish? Vietnamese? Turkish? In our multiethnic society, all sorts of institutions need help with languages: courts, social service agencies and customer service centers, to name a few. Typically you’ll need to get certified. But with that done, you’ll have the freedom of freelancing, taking jobs or turning them down. And a translator’s job can be the gateway to meeting fascinating new people and learning about new cultures. If you have a mind for numbers and computers, consider joining the small armies of tax preparers that firms such as H&R Block and Jackson Hewitt muster for the January-April peak tax season. Typically you’ll be doing the straightforward returns. Getting started: You can build up experience with AARP Foundation Tax-Aide, which trains volunteers to help older people with their taxes. Check the big firms’ websites for details of their programs. Many companies will require you to take classes that they offer in the fall. Getting started: Check the big companies’ websites for details. Note that many areas have local start-ups as well. Maybe your idea of a well-spent day is experiencing the great outdoors. Each year the National Park Service and state park agencies take on rangers for the summer surge. You can also seek employment in the parks’ hotels and restaurants. If you’re lucky, you’ll work in a historic lodge. Getting started: To find seasonal openings for park rangers, go to usajobs.gov and search “National Park Service.” For other jobs, look at the website of Aramark, a firm that the NPS uses for many of its facilities and concessions. Or check the website of your state’s parks department. The thought of working from home after years of commuting and office politics may be your idea of joy. If you’ve got what it takes to make a pitch, consider direct-sales firms like Mary Kay, Avon and Cutco. You need only a computer, internet access, a phone and a comfort level with calling strangers. You may have to pay for a start-up kit, but legitimate firms will buy back products you haven’t been able to sell. If you are one of those people for whom being with animals is never a chore, make a few bucks at it. Summer, spring break and holidays are the peak times, but there’s also demand year-round from working people who want Rusty to get some midday exercise. You get some, too! Some people have looked forward to retirement to indulge their love of craft work. You may be able to turn this hobby into a business, selling at local craft fairs or online. Promoting will be as important as making gotta-have-it products, but that’s part of the challenge and satisfaction. Getting started: Has someone in your workplace gone part time? Find out how the deal was struck. Then be your own advocate. Approach your boss with a specific proposal: how many days, what responsibilities you’d keep and so on. If you want to go back into your field but with a different employer, FlexProfessionals, a staffing firm based in Washington and Boston, can help you find work in those cities. Kerry Hannon is AARP’s job expert. Her latest book is Getting the Job You Want After 50 for Dummies. She has also written Love Your Job: The New Rules for Career Happiness and Great Jobs for Everyone 50+: Finding Work That Keeps You Happy and Healthy … and Pays the Bills. Find more from her at Kerryhannon.com. We have this gift of time, combined with our skills and talents, to create the best stage of life for ourselves. The greatest mistake, however, is thinking that our retirement years will be happy and perfect without any planning or preparation. It’s magical thinking that will lead to depression, disappointment, and even declining health. This chapter is about how, when you’re approaching your retirement years, you can reinvent yourself and allow or effect a transformation into a fulfilling new life. A Rewarding Retirement–This stage, with intentional forethought and design, will yield a healthy and balanced life. The retiree who achieves this is open to new sources of learning and exploration and carries a deepening sense of life’s purpose while nurturing rich, rewarding relationships. It’s never too late to be who you might have been. It’s never too late for a second childhood where you can explore without interruption yearnings and passions in the arts, in service work, in new areas of interest. 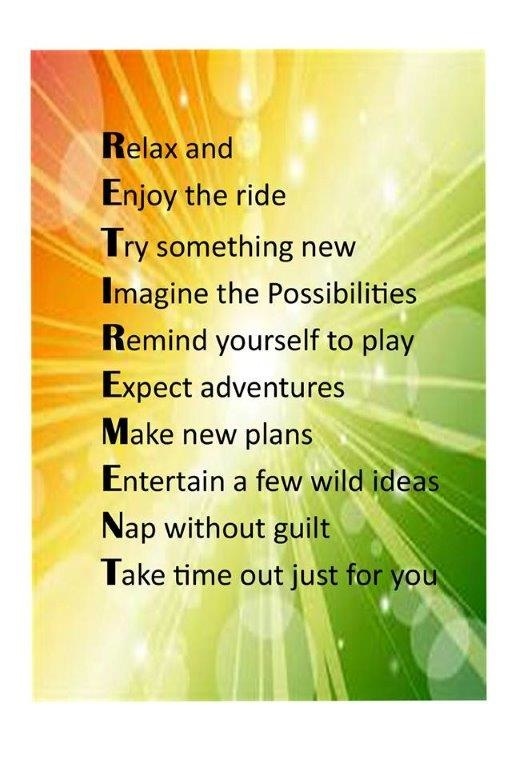 Retirement can then be experienced as an adventure, a process of experimentation in bringing out the best in ourselves and our interaction with others. how to retire with fire! A few important things to keep in mind about retirement! I have been thinking a lot lately about what aging authentically means. In my mission to help Baby Boomer Women defy ageism, I am particularly interested in helping each woman create her life powerfully-from the inside out. How we think about our age is much more important than a number. We can choose to think about our age from a place of innate power and possibility or weakness and limitation. Which perception will create your reality? Do you limit yourself by buying in to what it is expected of you at “your age”? Who made up that rule anyways? Don’t allow a youth obsessed culture to rent space in your head and heart. Don’t let it define who you are. When you look at how precious every day is, as life becomes shorter, start to embrace each moment and know that you can create the life you want. Stop playing victim to a number. Create your most amazing memories. Look fear in the face and do the things you have always wanted to do. Embrace your badass self fully. Focus on all of the things that you can do. Do more of the things that you are passionate about and less of the things you “should do”. When each of us owns our authentic power, we become comfortable in our own skin and we live our lives fully. Age doesn’t matter. In fact we embrace our age wholeheartedly. We understand that our age has given us so much. Our litmus test for what is true becomes more about being in alignment with our divine inner wisdom and less about being in alignment with what anyone thinks about our choices. We lead by example… effortlessly. We are not afraid of being visible. We know that we have so much of ourselves to share with the world. Oprah talks about aging as growing into oneself. I love that…you become more of who you are as you age…authentically more you. However, it is your choice whether or not you express your beautiful spirit or hide it from the world. It is your choice whether you illuminate the most divine parts of you with gusto or allow yourself to feel diminished. If you truly become more of what your true essence is, your spirit, then that is how you embrace your life fully. The opposite of that is living by default and playing the victim to age. People who do this sabotage themselves from all the golden nuggets that aging brings. How many times have you heard yourself or others use age as an excuse not to do something? Age is truly just a number. It is what you think about that number that is what really matters. Be mindful of the things that you are passionate about. Listen to the whispers. Get proficient at paying attention to your divine inner wisdom and notice all of the clues that light you up. Marianne Cherico helps Baby Boomer women create a life filled with joy, passion and purpose so that they can create a Smokin’ Hot Second Half. She is proud to be a member of this generation of women who changed the world for women, presenting future generations with limitless opportunities to thrive and grow into lives that are meaningful and authentic. It seems that more and more midlife women that I talk with are not happy in their jobs. They have worked hard for many long years, always putting the needs of their family first and this has often prevented them from going out on their own, for fear of being financially vulnerable and worse, letting their children down. I mean, there was preschool to pay for and often private school after and sports and camps and art lessons and braces and proms and college and internships abroad and weddings and yadayadaya. And for women who are either single or divorced, it is often even more difficult because they don’t have a partner to help support them. So they work in jobs to pay the bills and somewhere along the way they begin to wonder where they lost that fire of their youth…that “I can do and be anything spirit.” And as the years pass, they begin to look at their life and want something more, something just for them. But they are so stuck in their patterns of living and limited way of thinking that they don’t know where to begin. Or they feel as though it is too late. But I am here to tell you that there is always a way if you really want something and if you are one of these women, now is the time to start planning for it–not tomorrow or next week or a month from now. The clock is ticking. You see, sometimes we fail to plan because the mountain of our dreams feels so high and our dream seems so impossible. But if you focus on gaining clarity on what you want and implementing steps to get there, it will happen and you will be so happy that you began the journey. You just have to break free of limiting beliefs that get in the way. Because as we know all too well, time goes by fast and there is no more time to waste! So what is it that you have always wanted to do? Begin with that. Envision it, muse about it, feel as though you are in that dream life-BELIEVE! Here is an example. You are in a job that you hate but in the back of your mind you have always wanted to pursue your dream of being a make-up artist. You have done complimentary make up sessions for all of your friends and your services are being requested for their children’s weddings, professional photos, glamour shots, etc. You absolutely love doing this work but can’t make the leap from your steady job because you are ready to retire in 2 years and will lose the pension. You also believe that you won’t be able to pay your bills while building your business and all the other things that cause you to not take action. But what if you could change all that by simply changing your mindset? What if you decided that this dream was really important and you would make a commitment to yourself to go all out and make it happen. Start with envisioning what it would be like to work in a business that you love-that you created. What might your day look like? Would you start your day with yoga or plan to go for a walk in the middle of the day? Or maybe there is a hobby that you would like to explore and now you can work your schedule around it. Maybe you could travel more. Would you set up a room in your home that was just the way you wanted it so that your working environment would be pleasant? What might it feel like to design your business in a way that makes you happy, doing what you love? You will be able to take better care of your health. You will be able to spend more time with your children or Grandchildren. You can choose who you want to work with-your ideal clients. You can build your business as large as you would like-you are the boss! You can make as much money as you want-the sky is the limit. Add your personal benefits to this list. Now I am not saying that this is easy or even that it is for everyone. This is for those of you who are willing to work hard and create a life you want so badly that it trumps your fears. And we all have fears. In part 2, coming out the week of the 21st, I will give you some pointers on how to move forward in spite of your fears and limiting beliefs, so that you can create the life and business that you want. There are so many ways that you can achieve what you want, but you have to start by believing and building the dream. Marianne Cherico is the owner and principal designer of Interiors by Marianne Cherico. She’s not the self-absorbed type. We had to press Beskind to admit that, yes, her arrival at the global design firm IDEO where she works can cause a stir. Sometimes, an email goes out announcing her presence in the Palo Alto office. The other day, Beskind found a temp working at the receptionist’s desk. “He said, ‘I know who you are,’” she says. And so did his umpteen Facebook friends back home in Africa. At 90, Beskind is by far the oldest member of a dynamic team working on what’s known as human-centered design for food, packaging, electronics and, most recently, aging. She is also one of the newest designers at IDEO. She started last July after applying to be part of the firm’s design challenge for products for older adults. That challenge is over, but Beskind’s stint is not. Every Thursday, she travels by train from her San Mateo retirement community to the IDEO offices. “I’ve retired five times, but it’s like a vaccination that doesn’t take,” she says. Among her careers: 44 years in occupational therapy, 20 of those in the Army. She set up the first freestanding occupational therapy practice in the U.S., launched a lampshade replacement business and has written several books. Beskind takes a long daily walk using a pair of ski poles she adapted for the job. After one recent workday, she still had plenty of energy left to respond to questions from Senior Planet. As a 90-year-old non-designer, how did you manage to land a gig at one of the world’s best known design firms? I came on board and didn’t have time to enter an invention for the aging challenge myself, so they asked me to be one of the judges. Now I work with them on their projects. I’m sort of an ad hoc consultant. Which of your projects so far are you most excited about? I’m working on a revolutionary type of walker that is much more dynamic than the ones on the market today. My walker inspires the user to maintain a vertical position. Of my own projects, probably I am most excited about a separate living quarters that would go behind an existing home, for elderly people to live in independently or to be in for end of life or hospice care. There are some on the market, but I have ideas that would be an improvement. I would have an entire panel behind the bed and a plug-in where there could be oxygen availability and blood pressure monitoring. It would be prefab, the family could assemble it. It would have a chemical toilet, with water and electricity drawn from the house. The company that leases it would have to get all the permits. As soon as the person dies, the family would have to remove the structure. How do you feel when you’re designing? All I have to do is sit and watch people. I sit out in the hall of my retirement community and I see how many improvements are needed. What is your take on today’s technology? I don’t understand it, but I appreciate it. I have a Life Alert. I have a cell phone, but it’s very primitive – it has voice dial, which I need [due to low vision]. I have an enlarged screen on my computer, which I use for word processing. I’ve written a number of books on it. What does aging with attitude mean to you? You have to think outside of the box. Your have to be more than yourself. The world is more important than you are. Having a view of the world that is larger than you helps to maintain a productive, positive, expanded view. 1. First impressions count – you are being evaluated from the minute you walk into the room. Present yourself as energetic and vibrant – give the impression you can do what it takes to get the job done. 2. Get an up-to-date haircut and if coloring your hair would help, consider it. 3. Wear clothes that look “current”, are comfortable and that fit you well. Dress for the job you want. 4. Be aware of your body language – act alert, interested and enthusiastic – if you aren’t enthusiastic about you, how do you expect anyone else to be. 5. When face-to-face with the interviewer, give a warm smile, a firm handshake and direct eye contact to make a lasting impression. 6. Make sure you are current with the technology and changes within your field. 7. Focus on the employers’ needs, not yours. The main point the employer wants to know is what you can do to help them succeed. To address that, you have to have done your homework so you know what their needs are. 8. Have specific examples of successes and accomplishments that you’ve had in previous jobs that illustrate how you’ve used skills that pertain to the job you are interviewing for. 9. Interviewing is a two-way street. Make sure you have relevant questions to ask the interviewer – again, you will have had to conduct research on the company to decide what these might be. 10. Interviewing is selling and YOU are the product – highlight the benefits you will bring to the position so the Interviewer will see why you are the right person for the job. I want to make sure you have every opportunity to get calls for the jobs you want – in order to do this, you need to start with a stellar resume – so I am offering you a complementary resume critique – I know what it takes for a resume to get results! Just email your resume to me at careerist@aol.com and put “Resume Critique” in the subject line. I will then critique your resume. I look forward to hearing from you. Looking for a way to jump start your strategy for creating the life you want in the new year? CAREER QUEST CARDS TM (c ) are the perfect tool. To find out more, go to www.careerquestcards.com. I was manning a booth at the Harvard Club of New York’s authors’ night when an older woman approached and picked up a copy of my book, Reinventing You. She paged through it for a moment, then put it down. “Too late for me,” she said abruptly, and walked away. Over the past six months of my book tour, it’s a question I’ve heard often. Isn’t professional reinvention just for young people? What if I’m too old? How can I spend years training for something new, when I’m already near retirement? It’s true: reinvention is different later in your career. But that doesn’t mean it’s impossible. In fact, it’s increasingly essential for any professional who aspires to remain in the workforce for any length of time. Steven Rice, Executive VP of Human Resources for Juniper Networks, told me he specifically asks job applicants, “How are you adapting, and approaching your next reinvention curve?” The reasons, he says, is that, “People have to reinvent themselves to fit into the new context of work.” After speaking with hundreds of Baby Boomers (and beyond) who want to reinvent themselves but fear it’s too late, I’ve identified several key points for older workers who hope to make a transition. Understand you do have enough time. Some people think it’s not worth it to undertake any major changes later in life. Others disagree — such as my mother, who decided to get braces in her 50s, because she could be “either two years older, or two years older with straight teeth.” If money isn’t a concern, there’s no reason you can’t explore wildly new areas. (One friend’s father recently received his PhD at age 66.) If you’re still earning for retirement, you can absolutely pursue reinvention, but may want to consider more subtle shifts, such as taking classes on the side to expand your skills, rather than taking several years off to get a doctorate. Get with the times. Why should you be active on social media? Because — for better or worse — it is no longer optional. It’s even more critical for executives over 50 to have a social presence because it’s increasingly viewed as a proxy for staying current professionally. If your digital footprint is lacking and you don’t have a presence on basic sites like LinkedIn or Twitter, you’re likely to be dismissed as a Luddite. Indeed, even the basic notion of writing a resume is becoming antiquated; your “shadow resume” is Google. Connect with your past. We all know professional opportunities are likely to come from our existing network of contacts. But many don’t realize some of the most valuable information and opportunities come from “dormant ties,” or people we’ve lost touch with from the past. As Wharton professor Adam Grant writes, “Just like weak ties, dormant ties offer novel information: in the years since you last communicated, they’ve connected with new people and gathered new knowledge. But unlike weak ties…the history and shared experience makes it faster and more comfortable to reconnect, and you can count on them to care more about you than your acquaintances do.” It may be time to reach out and reintroduce yourself. Surprise people. On the other hand, your strong ties – the people you currently work with closely – may have developed fixed ideas about who you are and what you’re capable of, especially if you’ve been working in the same company or industry for a long time. If you want to reinvent yourself, you need to upend those assumptions, and hopefully do it in a dramatic way, so they’re sure to notice. Make a point of taking on an unexpected leadership role, taking a class in a new subject like computer programming, or explicitly requesting an assignment that intrigues you (your boss and colleagues may have grown to feel over the years that they “know what you’re interested in,” so it’s time to prove them wrong). Make them stop and question their assumptions about you. Reinvention after 50 is more than possible; it’s critical to keeping your skills fresh and your work fulfilling. Between staying current with social media, owning your history, reconnecting with old contacts, and shaking up the ossified view that current colleagues may have of you, you’ll soon be ready for the next chapter in your professional life. Dorie Clark is a strategy consultant and speaker for clients such as Google, Yale University, Microsoft, and the World Bank. She is an Adjunct Professor of Business Administration at Duke University’s Fuqua School of Business, and author of Reinventing You: Define Your Brand, Imagine Your Future. Follow her on Twitter at @dorieclark.